Target Canada’s liquidation sale kicked off this morning and if you were hoping for major discounts out of the gate, you’re about to be disappointed. Turns out most items in-store are only 5-30% off, depending on the department. 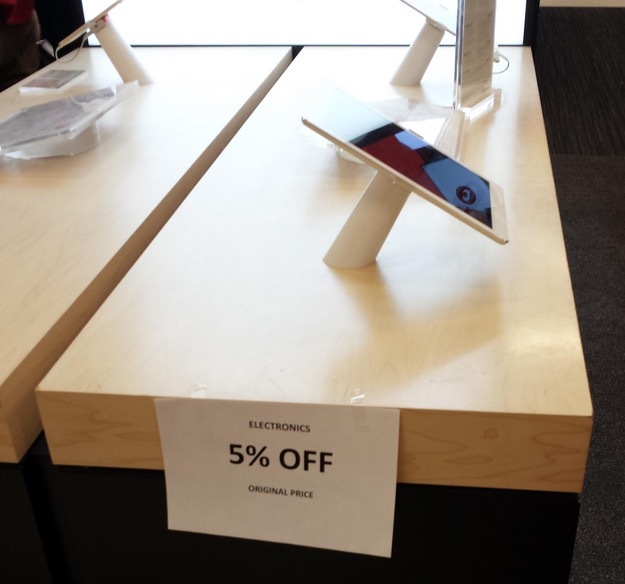 We’re told Apple products are 5% off (iPads, iPods, etc) and Apple accessories are only 10% off, including third party offerings. So there aren’t mega deals just quite yet. Most of the store has discounts of 10-20% off, while cosmetics are 30% off. Deal hunters on RedFlagDeals have noted it’s not worth going to the store as these sales are on top of Target’s already inflated prices. But despite that, bargain shoppers lined up outside stores anyways, such as those in Toronto, as The Hamilton Spectator reported “about a dozen people were lined up in the frigid cold outside the East York location around 7:30 a.m. before the store opened.” Ouch. The real sales won’t begin until the majority of store inventory is cleared out. That’s when you can experience being a real bottom feeder shopper, snapping up useless items you don’t really need for 70-90% off. Let us know if you picked up anything today! Thanks everyone for the emails!